The owner says "sell" and accordingly Robert Shepherd at Edmiston & Company sends word of a 20% cut in price for his joint central agency, along with James Lloyd, the 69m motor yacht Tia Moana. Tia Moana was built to ABS class by Australia's Austal Ships in 2003 and, more of a mini cruise ship than a superyacht, sleeps 50 guests with 42 crew. The accommodation consists of two VIP cabins on the bridge deck, 14 doubles on the upper deck and nine double cabins on the main deck. 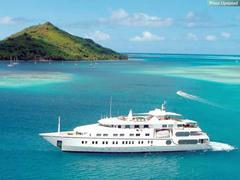 Tia Moana cruises at 12 knots and is now asking €20 million.